Sorry I have not posted much lately but I have excuses 🙂 I have been working a bit on the school class auction projects. I have to say it is a bit stressful but I love working with the students on fun free form things to put up for auction. Plus we raise money for the school which helps offset operating costs etc. So it’s a win-win. Anyhow below are a few with some steps on how to do them. Message me if you want more info or have questions. Happy Saturday! 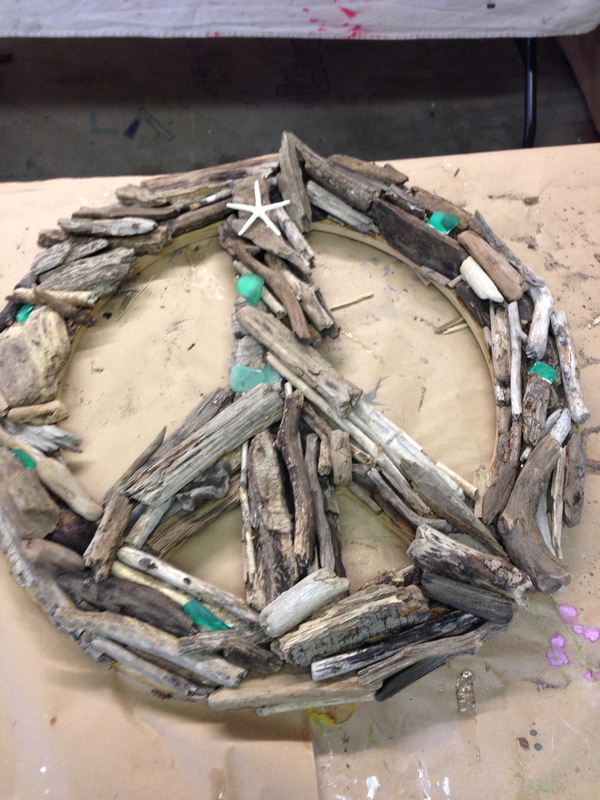 Second Grade driftwood Cross, Peace Sign and Mirror-I first had the second graders go out on a weekend and collect driftwood from the beach. 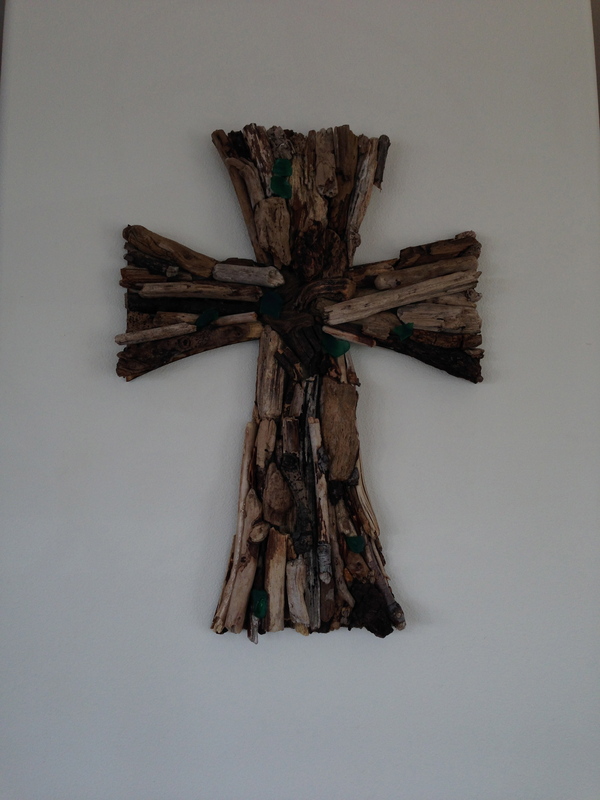 They of course brought back several bags of fabulous driftwood pieces which we could use for the project. I had them work in teams of 4 on each piece throughout my room along with a parent managing the glue process. I have to note that I always use Weldbond glue. It is non-toxic and just fabulous. It bonds and holds in rain and snow 🙂 Don’t really know about the snow part but it definitely holds up to water and outside conditions. Then I had to make sure the students glued the driftwood down to the forms and kept most of the glue off the top of the pieces. Glue is naturally shiny and it’s not terrible but for the most part I wanted the pieces to be natural on the forms. 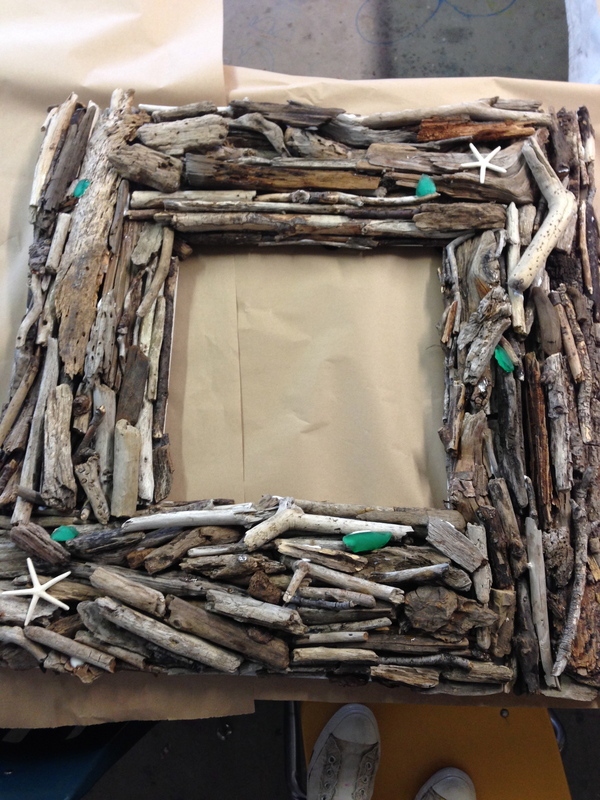 Once the students finished a good layer on the bottom the parents and I worked on filling in holes when the students were done and put a few glass and sea star pieces on. I purchased the crosses and the peace sign from Etsy.com. There are several people who make the MDF board pieces MrWoody is the one I buy from the most. These are really cute and fun for the students to participate in. I think I might have given all of the parents a few gray hairs during the project but its worth it in the end these pieces are amazing 🙂 Thank you parents! This piece was super easy and fun to do. I made a wooden piece like I do with my painting out of redwood fence board and 2 x 4’s to support the back. Then I put a Zbar on the back for easy hanging. Next I sanded the front to make a smooth finish and used painters tape to block off the square for the blue background on top left and the stars. I then purchased two-inch tin stars from factorydirect.com. They come in a few different sizes but these fit nicely. I drilled a small hole in the middle and then nailed them onto the board. Then I white washed the rest of the board with regular old house paint and water till I got the desired distressed look of wood showing through the white paint. Now I was ready for the students to put the red hand prints onto the board. 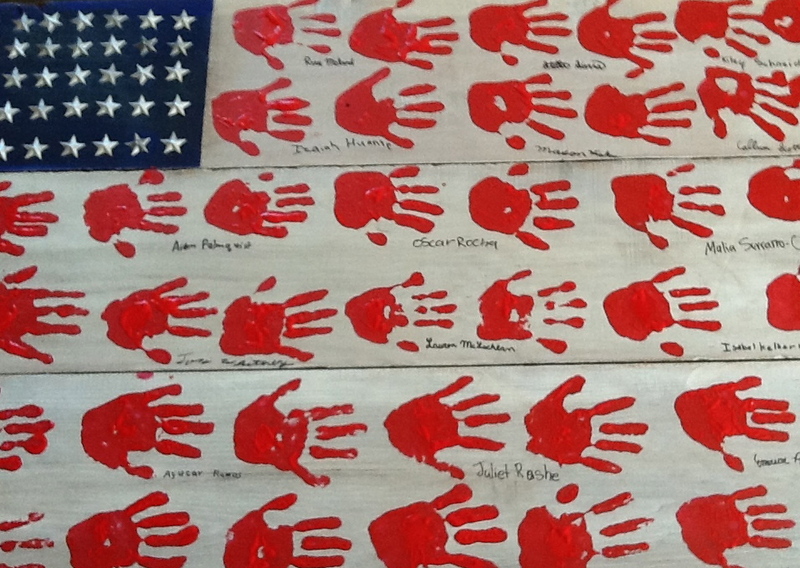 I then dipped their hands in red acrylic paint and carefully pressed them onto the board. We had a few splatters etc but those were easily sanded off to make it look more distressed. The students all signed their names under their set of hand prints I still need to use a tinted wax on it like Bri-Wax to make it look more distressed but I will do that next week. You can also just seal it with matte finish and be done. Either way it is adorable 🙂 I have to give credit to the pinterest pinner who did this originally…thank you!